Lewis Hamilton became only the third driver, after his late compatriot Jim Clark and Frenchman Alain Prost, to win the British Grand Prix five times and the first to take four successive victories at Silverstone. 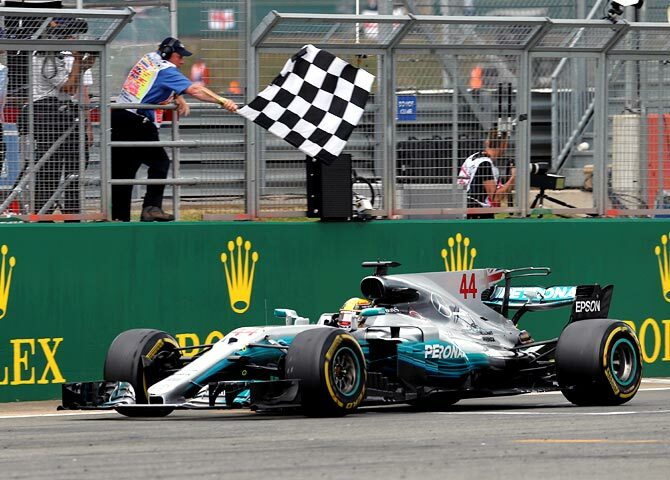 Lewis Hamilton won his home British Grand Prix for the fourth year in a row on Sunday while a penultimate-lap puncture slashed Sebastian Vettel's championship lead to a single point. The Briton's drive from pole to flag on an overcast afternoon was lonely, uneventful and dominant -- in complete contrast to his Ferrari rival's afternoon -- with Mercedes team mate Valtteri Bottas finishing 14 seconds behind to secure the one-two. "The support has been incredible this weekend. I am so proud I could do this for you all," said Hamilton, who threw himself into the fans for some 'crowd surfing' after the podium celebrations. "The team were faultless this weekend, Valtteri did an incredible job as well so it's the perfect weekend for us." Far behind in his wake, as Hamilton cruised to a 57th career win and soaked up the applause from an army of flag-waving fans, came sudden drama. 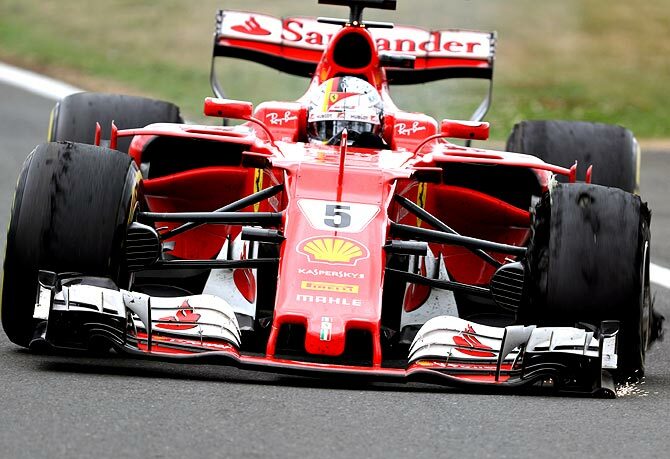 Vettel, who had battled on worn tyres but looked like securing the final podium position until the blowout, finished seventh after an emergency pit stop with a shower of sparks from the wheel rim. "There was no sign of that happening," said Vettel over the team radio. "There were vibrations but I had it for 20 laps and it didn't get massively worse. The tyres didn't look great but they never look great." The German's Finnish team mate Kimi Raikkonen, who had been second before also being hit with a late puncture that sent Bottas and Vettel ahead of him, took third. At the halfway stage of the 20-race season, Vettel has 177 points to Hamilton's 176 with Bottas on 154. Hungary, a circuit where the Briton has won five times before, is next up. 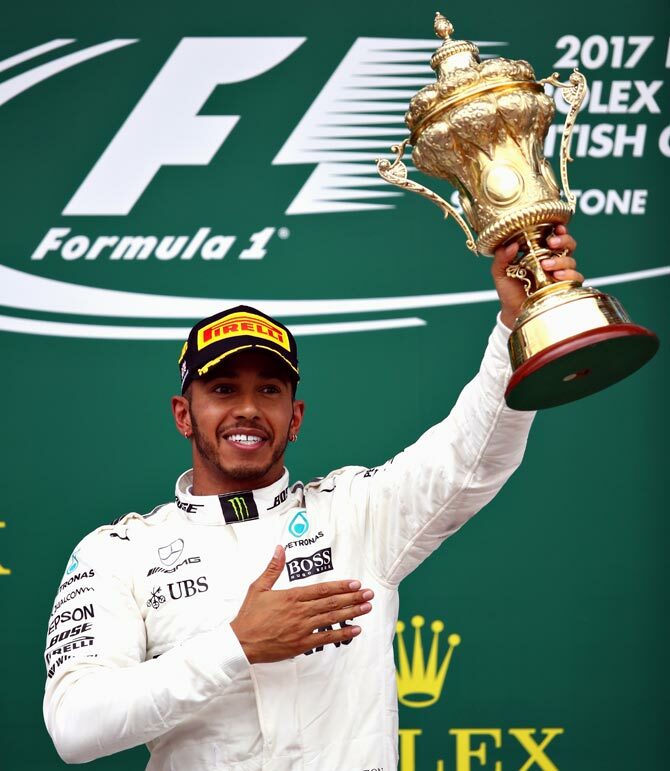 Hamilton became only the third driver, after his late compatriot Jim Clark and Frenchman Alain Prost, to win the British Grand Prix five times and the first to take four successive victories at Silverstone. Clark won four in a row in the 1960s but one was at Aintree and another at Brands Hatch. Red Bull's Max Verstappen finished fourth, ending a run of retirements, with Australian team mate Daniel Ricciardo fifth after fighting through the field. Germany's Nico Hulkenberg was sixth for Renault and Force India pairing Esteban Ocon and Sergio Perez were eighth and ninth with Brazilian Felipe Massa securing the final point for Williams. Jolyon Palmer's miserable run continued, with Britain's only other driver on the grid failing to make the start after his Renault broke down on the formation lap with a brake failure. That forced an aborted start, with the field doing another formation lap before the lights went out and Hamilton made a clean getaway. Vettel, brakes smoking, meanwhile lost a place to Verstappen. The Toro Rossos of Carlos Sainz and Daniil Kvyat collided on lap two, with the Spaniard shunted out and the safety car making an appearance for three laps. Kvyat, who has been involved in a series of incidents of late, looked at fault and was given a drive-through penalty for rejoining the track in an unsafe fashion. With Hamilton pulling away, Vettel and Verstappen provided some fireworks with the Dutch teenager keeping the door firmly closed as they went wheel to wheel. "He wants to play bumper cars or something," exclaimed Verstappen over the radio.